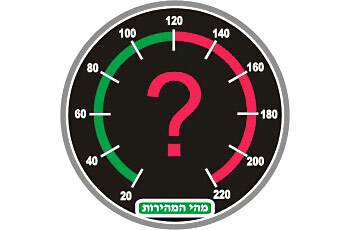 Where in the vehicle should the fluorescent vest be kept (except for motor-cycles)? Next to the spare (reserve) wheel. the passenger will be over 12 yrs. old. Yes, after coming out of a pub only. No, he is not obliged to do so. Yes, otherwise he is considered a drunk driver. Right of way is given to a vehicle transporting more than 8 passengers. Whoever arrives first has right of way. The faster vehicle has right of way. 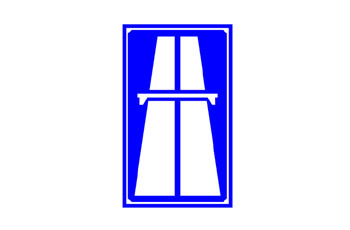 Both vehicles must keep as much as possible to the right and even pull into the “hard shoulders”. Which type of "city policing" vehicle is permitted to emit a blue light with a flashing yellow light? The following illustration shows an intersection with traffic signs. What is the correct manner of making a turn from street A to street C? Is it permitted to stand or park a vehicle on the sidewalk (pavement)? No, except in a regulated place marked with a sign.. Yes, it is permitted on an interlocking-stone-surface sidewalk. Yes, it is permitted on a sidewalk with a minimum width of 3 meters. The night time or any other time of the day in which visibility conditions are poor due to weather conditions. At what distance from a pedestrian crossing is it prohibited to stand a vehicle? Within twelve meters before the pedestrian crossing and twelve meters after the pedestrian crossing. Within twenty meters before and after the pedestrian crossing. On the pedestrian crossing and within twelve meters after it. On the pedestrian crossing and within twelve meters before it. When is it permitted to overtake another vehicle? Only when the overtaken vehicle is a slow vehicle. Only if the driver of the overtaken vehicle gives a signal to the driver of the overtaking vehicle. Only when the overtaken vehicle is a motorcycle. When the road is clear and you can overtake safely without causing danger to any other road user. 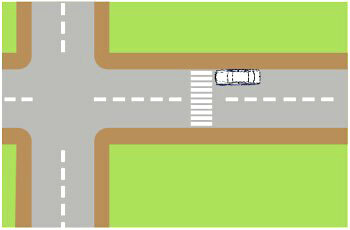 On a narrow two-way road with an unbroken separation line dividing the two lanes, how would you conduct yourself when a horse drawn wagon drives before you and the opposite traffic lane is open? Continue driving slowly behind the wagon. Try to overtake the wagon from its right side and drive on the “hard shoulders”. Overtake the wagon in accordance with all traffic rules, but only if the road ahead is open. Overtake the wagon to prevent traffic delay. How should you (vehicle no. 3) behave while you turn right in the following intersection? 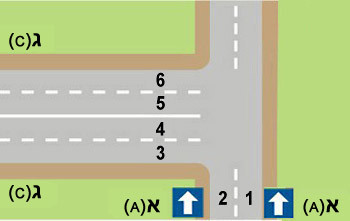 Enter (3) the center of the intersection in order to prevent the blue vehicle from hitting the cyclist.. Allow the cyclist to continue riding and turn right behind him. Overtake the cyclist, quickly and carefully, while he is waiting. 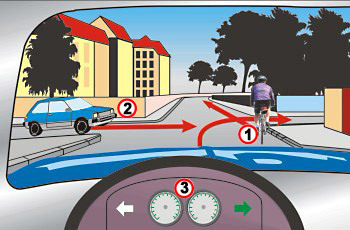 Honk loudly to the cyclist (1), so that he will allow you to complete the right turn. When is it lawfully required to perform a vehicle license test? Every two years, for all vehicle types. Every two years for commercial vehicles and every year for motorcycles. Every two years for all types of private passenger vehicles, without any restriction on the vehicle’s age. Every year or any other lawfully defined period. He enters the traffic flow in the same speed as the other vehicles. From the answers before you, where especially should a driver slow down? Whilst driving on a main road. Whilst driving on an inter city road without a built central divider. How can a cellular phone be operated whilst driving? Only by means of a “hands free device” that is installed in the vehicle and can be used without being held. When an intersection is posted with both traffic signs and traffic lights, the instructions of which has the priority over the other? On which part of a road should a cyclist ride? As close as possible to the road’s left edge, facing the incoming traffic. As close as possible to the right hand side of the road. Where all other vehicles are driving. It is absolutely forbidden to ride bicycle on any part of a road. How do you give a signal for braking? By turning on the four direction indicators. By putting out the right hand through the left window. By putting out the right hand through the right window. Is it obligatory to install a mirror on a motorcycle? No, except for motorcycles and a side-car. Yes, it is lawfully required on all types of motorcycles. No, the driver can decide at his own discretion whether or not to install a mirror. Yes, but only on motorcycles with a sidecar. A system for issuing demerit points to drivers who are convicted of committing traffic offences once every five years. A system for issuing demerit points to drivers who were convicted of committing offences against the traffic regulations. A system through which courts are notified about vehicle improper functioning. A system for registering convictions in criminal offences. You should stop before the railway crossing until the train passes. If the train is far, you should quickly cross the rails. 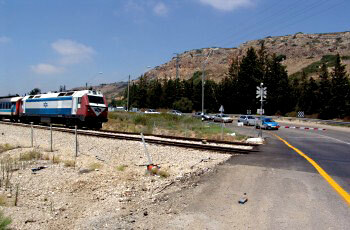 You should accelerate and cross the rails before the train arrives, in a careful and watchful manner. You should carefully cross the rails, in any fitting speed. Not obeying a red light or not giving right of way. Driving a motor vehicle without valid insurance. Not stopping by the stop line besides a traffic light. Not placing a “new driver” sign on the vehicle’s rear window. When a U-turn prohibiting sign is placed. Where the vehicle cannot be observed by other drivers approaching from any direction. When he approaches a steep peak or a curve in the road. Revoking a driver’s license, prison term, fine and other lawful penalties. Fine or only suspended prison term. Revoking a driver’s license or only suspended prison term. Fine, active prison term or only suspended prison term. When is it permitted to use the horn for giving a warning signal in an urban road? It is only allowed to use an air horn. It is always allowed to use the horn, provided that the signal is given in a continuous and uniform manner. It is only allowed to use the horn in order to avoid imminent danger that cannot be prevented in any other way. It is always allowed to use the horn in an urban road.